The Chicago Blackhawks polished off the 2016-2017 season with a 50-23-9 record, good for first in the Western Conference with a total of 109 points. The Nashville Predators slipped into the second wild card spot in the Western Conference, with a 41-29-12 record and a total of 94 points. The Predators overcame a run-of-the-mill season to end on a 9-5-1 run. They had a dozen players line up at least 25 points, while Chicago had 10 players score 25 points. The Predators had a dozen players score at least 10 goals, which compares to the Blackhawks’ seven players who reached at least 10 goals. On paper, it’s hard to chart the offensive advantage. The Blackhawks scored 244 goals to Nashville’s 240 and things could be closer than many realize. The Blackhawks have the experience edge. 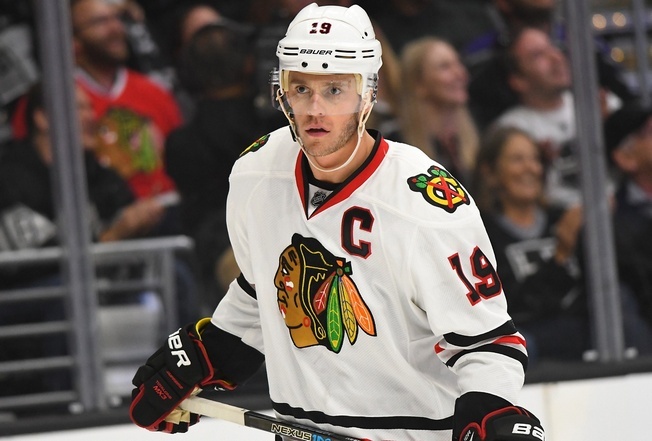 Jonathan Toews and Niklas Hjalmarsson have each played in 124 playoff games for Chicago, while Patrick Kane has 123 post-season games under his belt. Compare that to P.K. Subban of the Predators, who’s played in 55 playoff games – all with Montreal. Toews put together a 58-point season in 72 games. He is a responsible player at both ends of the ice and leads by example. He averages 20:09 of ice time a game and scored six goals on the power play. He wasn’t piling up points early and had just nine goals before the All-Star break, but he managed 28 points in his last 26 games and finished strong. Kane had 89 points in 82 games, including 34 goals. He averaged 21:23 of ice time a game and had 292 shots on target, putting up 1.09 points per game. He continues to be one of the most dynamic players on the ice and he’s awesome in big games. Artemi Panarin had 74 points in 82 games, including 31 goals. He averaged 19:28 of ice time a game, including nine power play goals. He also had 211 shots on goal, averaging nearly a point per game. Panarin also just cost the Blackhawks a pile of money in bonuses thanks to his stellar play. Richard Panik had a great year, scoring 22 goals for the first time his career. He’d never scored more than 11 before and the jump set him up as a secondary scoring threat. Look for Panik to slip in the back door as the Predators focus on the Blackhawks’ big guns. Viktor Arvidsson picked up 61 points for the Preds, including 31 goals. He’s in his second season and will be looking to make a post-season impact. The Swedish forward averages 17:09 of ice time a game and boasts terrific skating skill, plus he’s a hard worker. Filip Forsberg draws top billing in most depth charts and for good reason. He had 58 points in 82 games in the regular season, including 31 goals, and he plays 18:31 a game. He had three short-handed goals in 2016-2017 and is a threat in transition. Forsberg plays a rock-solid two-way game, which makes him a fixture on special teams. Ryan Johansen had 61 points in 82 games, including 14 goals. He averages nearly 19 minutes of ice time a game. The Vancouver native had four power play goals and one short-handed goal, but reliability somehow still dogs him after five years in the league. Rookie Kevin Fiala could serve as a slippery playmaker with a little conditioning, but he’s already put together a 16-point debut season in 54 games. He averages 13:30 of ice time a game and can be dangerous in one-on-one situations, but he’s not a physical force and could stand to bulk up. Duncan Keith continues to drive the action from the defensive zone. He had 53 points in 80 games, including six goals, and he averages 25:37 of ice time a game. He registered 183 shots on target and has two game-winners. Keith is an incredible skater, which makes him a relentless nuisance for the Predators. Hjalmarsson is ready for the playoffs after the birth of his second child. He brings the experience factor and put together an 18-point campaign in 73 regular season games. The Swedish defenceman averages 21:29 of ice time a game and likes to block shots, plus he can move the puck. Brent Seabrook is another accomplished defender, with an average of 21:53 of ice time a game and 39 points in the regular season. He has 11 years in his pocket for Chicago and is a mainstay on the blueline, where he plays a calm and cool brand of hockey. The Predators get a lot of scoring from their defence, starting with Roman Josi. The Swiss blueliner put up 49 points in 72 games and is on the day-to-day list, but he should be back against the Blackhawks. The 26-year-old had 119 blocked shots in the regular season and averaged 25:04 of ice time a game. Subban had 40 points in 66 games and averaged 24:24 of ice time a game. He’s a marvellous skater and rushes up ice with minimal effort, plus he quarterbacks the power play. Subban had three power play goals in the regular season and must be looking forward to making a post-season impact in Nashville. Mattias Ekholm averaged 23:27 of ice time a game and listed 120 shots on goal, with 23 points to show for his efforts. The Swedish defenceman has a big shot and plays a solid all-around game. And Ryan Ellis averaged 23:57 of ice time, with 38 points in 71 games. He’s yet another element of Nashville’s dangerous defensive set. Corey Crawford is one of the most reliable goalies in the NHL. He achieved at least 32 wins for the fourth consecutive season and put up a 2.55 goals against average with a .918 save percentage. He had two shutouts and has the attitude to win every game. Scott Darling is the backup. He’s tall at 6’6 and covers a lot of the net just by standing there. He went 18-5-5 this season, with a 2.38 goals against average and a .924 save percentage. Darling also had two shutouts. Pekka Rinne continues to hold it down for the Preds. The Finnish netminder is a sizable presence in the crease at 6’5. He went 31-19-9 in the regular season, with a goals against average of 2.42 and a save percentage of .918. He posted three shutouts and never quits. Ever. Backup Juuse Saros is also from Finland. He posted a 10-8-3 record, with a 2.35 goals against average and a .923 save percentage. He’s noted for an ability to read shooters, plus he has swift reflexes. Saros is on the small size and tends to play deep in the crease, so he’ll be tested if something happens to Rinne. The Blackhawks have the experience and that counts for a lot. They could score plenty of goals, even if the Predators can spread the offence around more. Things are close. The Predators could have the edge in goal, for example, and possess the more mobile defence. But the Blackhawks are more responsible in their own end and won’t make many mistakes. They also have more dynamic forwards, but Nashville can shut things down defensively. My call: Chicago in seven.